Have a beautiful scarf? 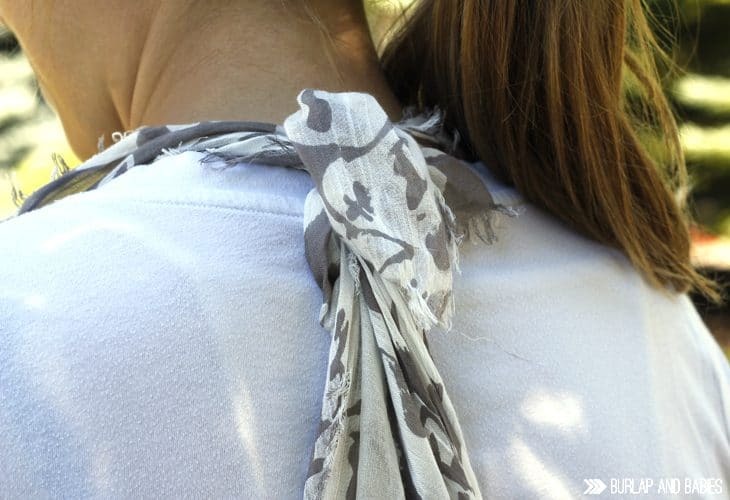 See how to tie a scarf into a vest so you can wear it for any occasion! Do you have a favorite scarf but sometimes it’s just not scarf weather? I have been running in to that problem all the time right now with this killer heat wave we’re in! I don’t wear necklaces anymore because squirt thinks it’s so fun to pull them and I’m not a pattern person typically, so what does that leave me with but boring, plain t-shirts? Until I discovered that you can take your awesome scarves and still wear them in this heat. So let me take a few moments here and show you how to turn a scarf into a vest that is perfect for any occasion. All you need is a scarf and a few conveniently placed knots and that’s it! Sorry, but infinity scarves won’t cut it for this one. This is also my contribution to another fabulous day of DIY scarf inspiration. Check out everyone else’s posts at the bottom of this. Take your scarf and hold it out. Take the two corners on a long side and tie them together. Now grab the middle of the opposite long side and tie that onto the knot you just made and you’re done. Now you have two arm holes and can put it on with the knot at the base of your neck and your golden! You just learned how to tie a scarf into a vest! The scarf refashion fun has only just begun! Be sure to chomp those shark scarf teeth into each of these inspirational D.I.Y. projects hitting the blog-o-sphere today. Well, we’ve reached the grand finale of Scarf Week with today’s theme of Scarf Refashions, and grand it most certainly was! If you’re just tuning in, this was just one of five inspirational themes from this week. And you can check ’em all out by visiting our co-coordinators, Lauren from The Thinking Closet and Vanessa from Tried & True. And you can also explore all of the creative projects we’ve been sharing on social media by checking out our hashtag, #ScarfWeek2015. This week has just been wave after wave of killer inspiration, no fish-bones about it! Thanks for coming along for the ride. It has been JAW-some! 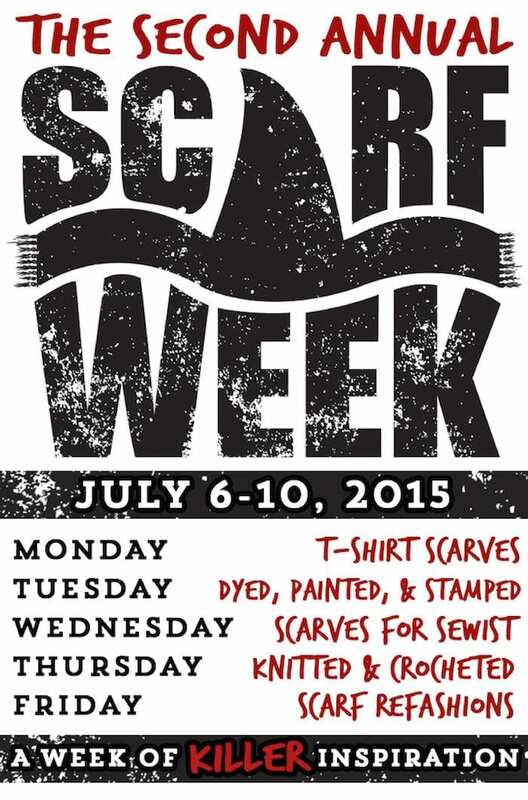 Until next year…stay scarfy! Ok, cheesy puns over. Have a great day!! And just like that you’ve doubled my wardrobe. :) Vests for the win!! No way – it’s that easy?! Genius! I have got to try this! So cute! I love how simple it is but it looks fantastic!! So cool! Perfect for summer! I was floored to see that there was no sewing involved in this one. SO stinkin’ simple! (I need more of those refashions in my life.) Thanks for this fab tutorial! What a fantastic post in our Grand Finale of Scarf Week 2015. While I’m sad to see it end, it certainly went out with a bang thanks to you gals. Virtual hug comin’ your way.